Michael Ferri appeared on Show 220, recorded in October 2010, at age 15. 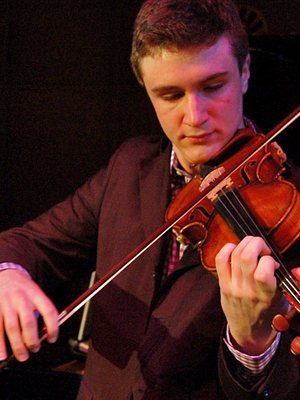 Michael Ferri (violin), 15, hails from University Heights, Ohio, where he is home schooled and attends the Cleveland Institute of Music, where he studies with Paul Kantor. He is a recipient of From the Top’s Jack Kent Cooke Young Artist Award. Michael is a part of the Cleveland Orchestra Youth Orchestra and volunteers at the Cleveland Clinic with TACO (The Awesome Children’s Orchestra). He has attended master classes with Francesco Manara, concertmaster of La Scala Orchestra in Italy. In his spare time Michael enjoys cooking, reading, studying history and correcting grammar. Michael is a Jack Kent Cooke Young Artist.